Widnes Vikings supporters can help the Rugby League family of Papua New Guinea, by taking part in a special campaign to donate playing shirts to people in the nation. 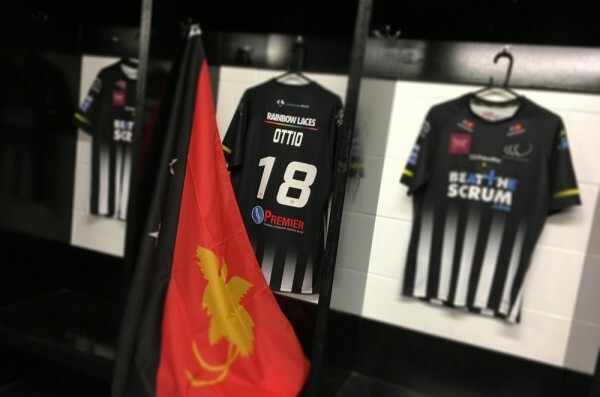 In recent months, Widnes Vikings have formed a powerful connection with the people of PNG, following the signings of Stanton and Albert Wellington, and the overwhelming response to the tragic passing of Kato Ottio. The Club is exploring ways to develop this connection and give back to the nation that has so warmly reached out to it. Widnes Vikings are proud to announce a new partnership with the Stanley Gene Foundation, which is committed to helping the remote communities of Papua New Guinea and educating young Papua New Guinean children. The charity, which is led by the legendary PNG international, makes a real difference to thousands of people in the nation. Stanley is currently arranging for a container of goods to be sent to PNG and has reserved space for Widnes Vikings supporters to donate their old replica shirts. These shirts will be given to rugby league supporters and players, in tribute to Kato Ottio. Widnes Vikings will also be providing a large donation of good to support this cause. Supporters looking to support the collection can donate their replica shirts at the Halton Stadium, the Vikings Superstore, located within Tesco Extra or from the Vikings Outlet located within Widnes Indoor Market from today until next Monday. Please note, there is limited space available for this collection, and once capacity is reached we will unfortunately be unable to accept further items. Supporters will be advised on the Widnes Vikings website and social media channels when the limit for donations is reached. The Club hopes to assist further shipments to PNG later this year. James Rule, Chief Executive of Widnes Vikings, says: “We have been overwhelmed by the respect shown to our club by the people of Papua New Guinea, and we want this to be a relationship that flourishes over the years to come. As a club, we have been exploring ways to support our new friends in PNG, particularly following the tragic passing of our teammate Kato Ottio. Naturally, there are many logistical challenges in working with a nation that is so far away, so we are very grateful to Stanley for the support that he is offering.